This is FOV80020 German 3 Ton Cargo Truck, Eastern Front, 1943-1944 from Forces of Valor. Opel Blitz was the name given to various German light and middle-weight trucks built by Opel between 1930 and 1975. During the years preceding World War II Opel was Germany's largest truck producer. The Blitz name (German for “lightning”) was first applied to an Opel truck in 1930 and by 1934 there were four base versions offered of the 1 tonne model along with fourteen versions of the larger 2/2½ tonne trucks. From 1939 onwards the 3-ton version was used frequently throughout World War II. The 3-ton Opel "Blitz" truck was the Wehrmacht's principal general-purpose truck during World War II. The engine was a water-cooled, straight-six OHV gasoline unit of 3.6 liters that was fueled by a 21.6 gallon gasoline tank situated under the driver's seat. 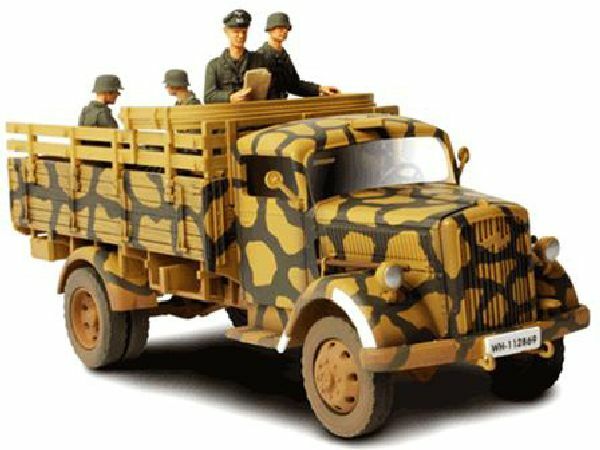 The Forces of Valor replica is a Troop Transport version used by the 4th Panzer Division on the Eastern Front, 1943-44. Includes a driver and four soldiers.